Did you know that Andrew Barr wants to weaken the restrictions on billboard advertising in Canberra? The fact that we have so few billboards is one of the truly special things about this city. Help us keep in that way! The Green Institute and SEE-Change invite you to a briefing, forum and submission-writing session. 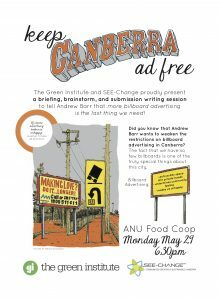 Join us to tell Andrew Barr that more billboard advertising is the last thing we need, and help keep Canberra ad free! ANU Food Coop, Monday May 29, 6.30pm.